FluTrackers (h/t Biological) today has picked up a report from the Jiangxi Provincial Health and Family Planning website somewhat belatedly announcing what is China's 8th human H5N6 infection to date. While the patient was hospitalized (and died) in a Ganzhou hospital, he apparently lived in Jieyang City, Guangdong Province - a city which has recently reported two H7N9 cases. Guangdong province has also reported three recent H5N6 cases. 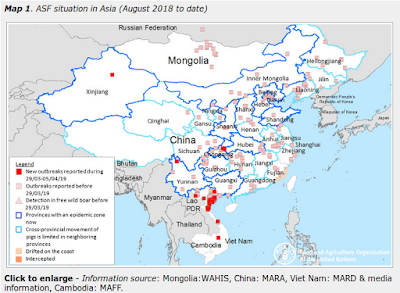 In the 20 months since the H5N6 virus was first detected China has reported 8 H5N6 cases, 4 of which have occurred in the past three weeks. And all four recent cases either occurred in, or have links to, Guangdong Province. After entering the winter and spring of influenza and other respiratory diseases high season, the province stepped up surveillance of influenza, severe pneumonia. In routine monitoring, from 1 cases of severe pneumonia cases detected H5N6 avian influenza virus nucleic acid positive. 1 month 7 days, the Chinese Center for Disease Control to review the detection identified as H5N6 virus nucleic acid positive . Provincial expert group on the basis of the clinical cases, laboratory testing and epidemiological findings, diagnosis in this case as H5N6 confirmed cases. Patients, male, 42 years old, currently residing in Jieyang City, Guangdong Province , has a history of contact with live poultry business market exposure history. December 21st due to fully died in a hospital in Ganzhou. All close contacts did not appear abnormal normal. Experts judged the view that this case appears as sporadic cases, the lower the risk of spreading the virus at this stage. While H7N9 and H5N1 have proved to be the most dangerous avian flu viruses to date, H5N6 is showing signs of being a contender, and is definitely a virus to watch.